"Your humor, energy, stamina and enthusiasm generated so much more giving." 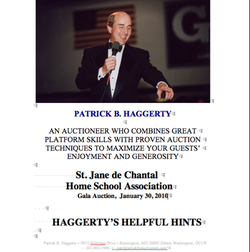 Pat Haggerty is a "full service" auctioneer. Your partner in success from day one to the day after the auction when you receive a "Results Review" helping you plan every step of your event. Pat does not use the auction "chant" but has a fast moving, humorous "conversation" with your guests. His platform skills combined with his upbeat personality and humor make the evening fun while raising funds for your cause. Pat's considerable rapport with the audience makes my guests want to participate and have as much fun as Pat is having which, of course, makes them better bidders. Pat brings the whole package: he coached my speaker on her delivery, plus he helped us with the order of sale, the agenda and many other details that made the evening flow smoothly. Our live auction was extraordinarily successful, bringing in 60% more revenue. Your high energy engaged the crowd, put everyone in a good mood and empowered them to support our school. Your ability to "connect" with your guests is obvious. Pat knew exactly what to say to open the bidders hearts and, therefore, their wallets. Only half of Pat's value is the night of the gala. He expertise in planning the agenda, the room flow, the order of sale of auction items and similar knowledge helped us plan and then execute a gala with minimum hassles and maximum revenue. Pat made our gala so much more interesting by engaging the audience in creative ways. He had the winning bidder of a Live Auction item last year come to the stage to talk about what a great time they had. He called a teacher up to talk about how the children lovingly used their little hands to make the class project. His ability to combine his upbeat personality with the expectations of our parents was wonderful. Contact Patrick Haggerty for this 8 page, easy-to-read booklet FULL of ideas, helpful hints, and DO's and DONT's that will make your Gala Auction more successful for you and more fun for your guests. Are you considering using an electronic bidding system? My clients who use BidPal are very happy with it. Feel free to ask how it works.